Our latest project brought us back to California! 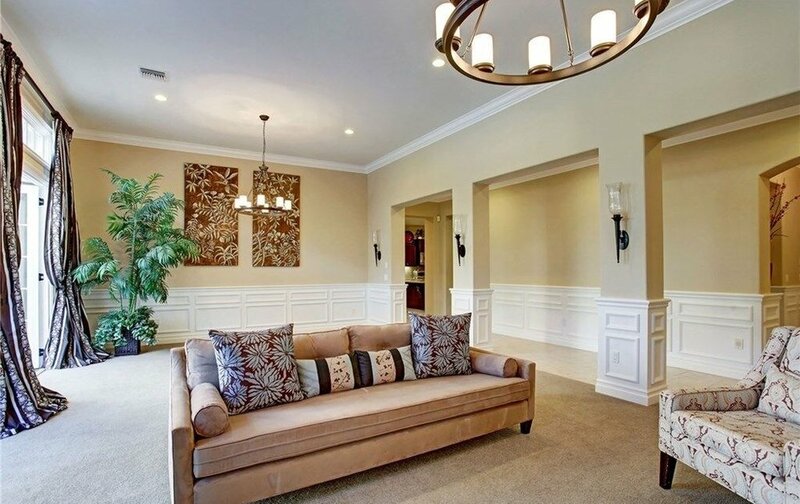 When our clients reached out to us they had just bought a new home that felt VERY 90’s. We wanted to update it to represent the young, cute family that they are. We busted through the install, photographed the space, and shot the video all in ONE DAY! We’re so excited to show you how it turned out. Don't miss the webisode! 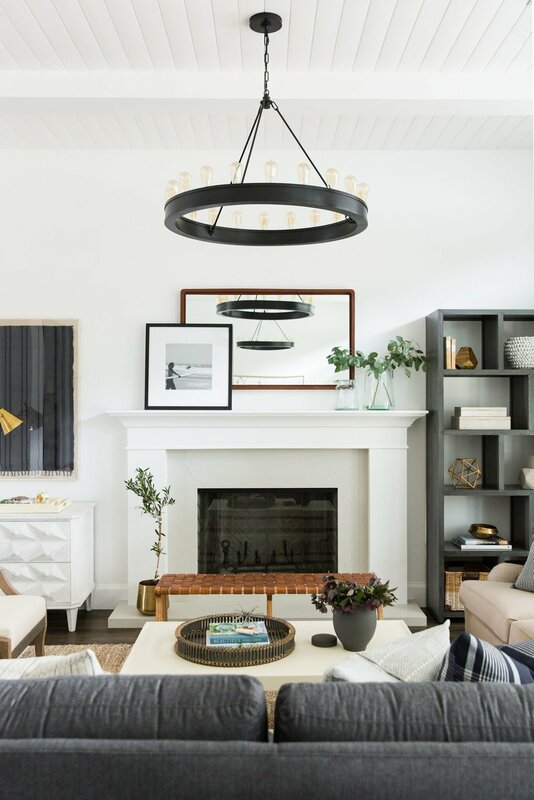 Catch up with the rest of the Calabasas Remodel by checking out the Master Suite, Kids' Rooms, Family Room, and Kitchen + Laundry Room! The Great Room had wall-to-wall carpet, overpowering drapes, and needed something to make it feel grand. 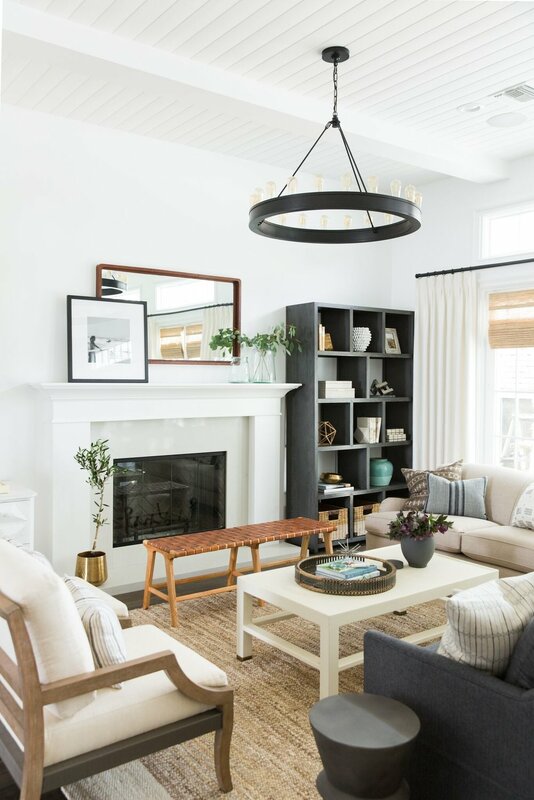 With a long space like this, we knew we needed to divide it into two spaces so we made a formal great room and dining room with easy going California vibes. 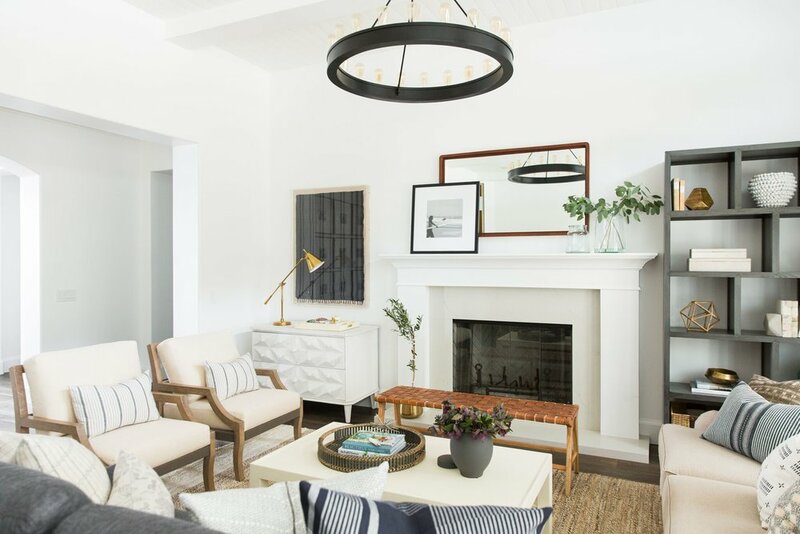 Our clients wanted white walls and a sunny bright aesthetic. They loved the idea of contrast, so we used dark hardwood floors to bring depth. The drapes were huge bore, with a lot of extra fabric. We used stationary panels layered with a woven shade, using a layered look that makes it feel coastal. 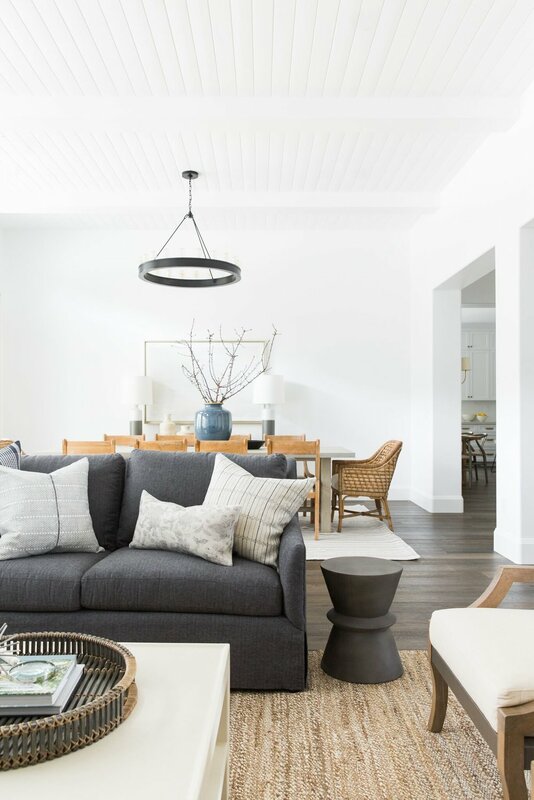 The tongue in groove detail in the ceiling beams make the space feel grande. The great room is the first thing you see when you enter so we wanted it to be open and conversational. We didn’t want it to be too formal and uniform, so we styled a dresser as a console and modern shelving unit on the sides of the fireplace. The charcoal sofa and indigo vintage artwork in the sitting room are dark contrasts that bring depth, so we complimented these by using monochromatic natural tones on the dining room. We needed to make a statement, so we grounded the table with a large vase. The blue color is bold, but natural, and it serves as the perfect home for these grand branches. Woven textures and wood tones keep it feeling lively, so we used chunky, wrapped dining chairs at the head of the table and used the Anders Chair for the rest of the seating. The natural wood and woven rope play off each other, making the space feel coastal and textured. An indoor/outdoor rug is durable, and keeps the formal space feeling casual. *Please note the dining table featured in this space is a custom 9 foot Benu Dining table and the overall dimensions differ. This custom size is not available on our site and cannot be reproduced.